A few weeks ago on my way to yoga teacher training, I experienced a full on vision. In one brief moment, I saw a seemingly challenging obstacle in my life resolve itself through yoga. Ever since I had my son Mason, I knew with every ounce of my being that I wanted to homeschool him, and although his dad and I are fully committed to navigating homeschool life, we decided that preschool would give him a solid foundation before we fully dive in. Mason has been enrolled in Roots Preschool since January, where crucial social connections are being made with his peers. I know in my heart that another year of preschool will do wonders, and with significant shifts happening in our lives we would be doing Mason a disservice by beginning home education this year. My challenge here is that the price of tuition is currently beyond my means. My Yoga practice has been a saving grace for the past two years, and the recent training with Mangala Yoga has sparked a deeper understanding. Mason and I practice together regularly and I see how it has expanded his awareness of his body and mind; giving him control over his breath as a powerful tool to help calm himself amidst great challenges. I have dreams of freely providing yoga to high school aged youth in a way that can empower these up and coming citizens through connection with their bodies and their life force. However, I need more experience before taking on this endeavor. This is my vision. 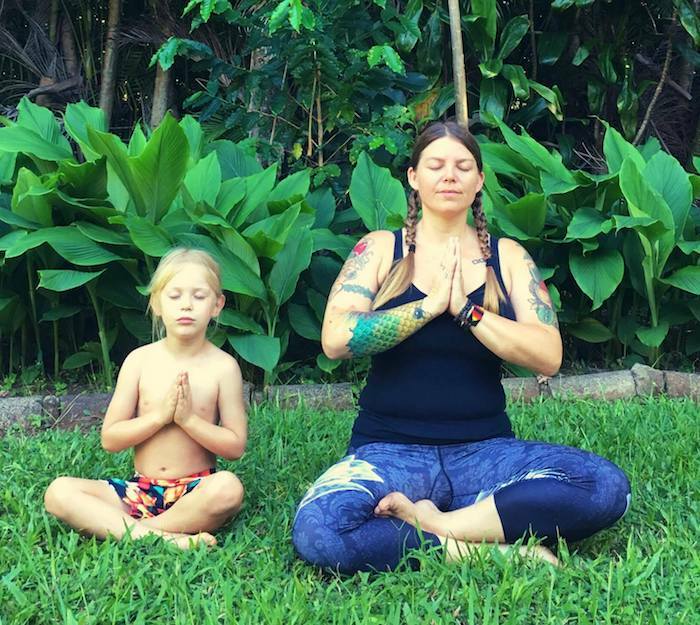 Beginning this September, and throughout the entire 2017/2018 school year, I will be offering FREE Maui Community Yoga to the entire island. I plan on connecting directly with the people through The Mauimama, social media and coconut wireless to discover where and when the classes will be held every week. I believe yoga should be accessible to anybody who is willing and able to show up. To help remove my obstacles, I am asking the community to help by sponsoring Vinyasas for 10USD each. Throughout each class I will offer ten Vinyasas (a sequence consisting of chatarunga, up-dog, and down-dog). My goal is to raise enough sponsorship to cover the cost of Mason’s last year of preschool, and strengthen his roots before his homeschool journey begins. I am offering this karma yoga regardless of sponsorship. However, because you believe in Maui Community Yoga and its benefits, become a sponsor by Visiting tinyurl.com/SponsorMCY. Follow this project on social media for class details, and see how the Maui Community shows up on their mat! Previous articlePacific Birth Collective bringing the Positive Birth Movement to Maui! Sommer Waagosh Tarro is a joy filled mama to a little son! She is the saltista in charge of Hot Mama Sommer Salt and one of the light technicians in charge of the lighting at the MACC. Sommer also recently received her RYT 200 yoga training through Mangala Yoga.